Hey, Fairfield, Reduce Your Waste! It’s Frugal and Sustainable! In 2003, our Smith and Hawken compost bin was a Consumer Reports Best Buy. 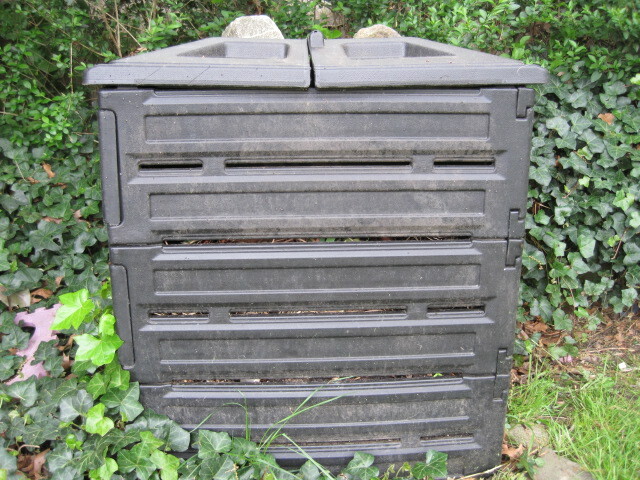 Today, there are many affordable recycled plastic compost bins from which to choose. Better yet, DIY, do-it-yourself! With a compost bin and worms from the backyard, our vegetable scraps turned to soil. 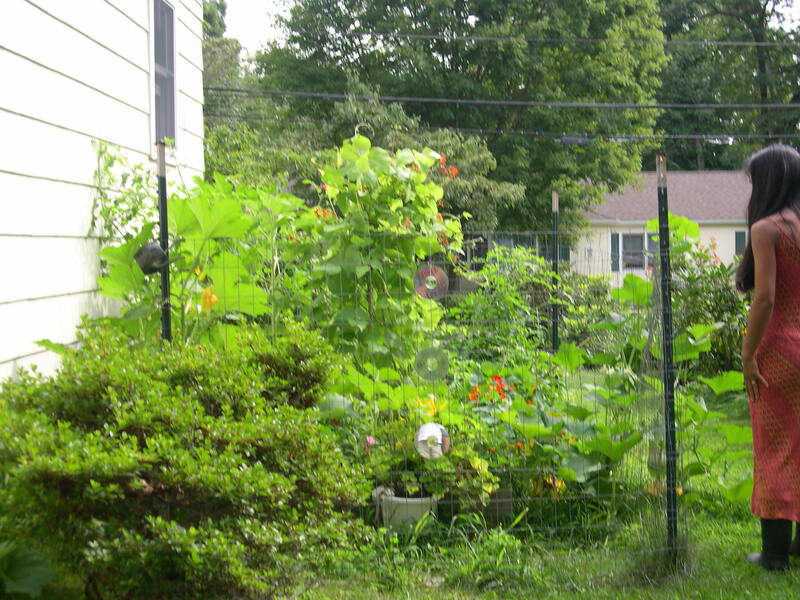 Composting eventually led to the start of a modest 4’ x 8’ ft. raised bed garden, which in two years lowered our food bill and raised our health quotient. Cherry tomatoes, bush beans, butternut squash, rosemary, basil, sage, nasturtium, marigold and pumpkin grew in our side garden. Cucumber grew next to our roses in our front garden. Freecycling decreased our need to purchase items. I’ve gotten great toys and games, arts and crafts, bread machines, glass bakeware, winter boots and clothing -in great condition- for our family. Conversely, by offering items Freecycle, I began the long, on-going process of de-cluttering our house. With composting and Freecycling, our trips to the dump and our spending began to decrease even more. Bonus: the environment benefited, too. Other ways we began to cut down on waste and spending: for the last five years, since my daughter started 1st grade, we have been using cloth napkins, and much to my husband’s dismay, stopped using paper towels. Instead, we reuse rags, wash with cold water and hang clothes on outdoor- and/or indoor- laundry lines. Also, for the last eight years, we have belonged to an organic and natural food co-op. We save a lot by buying “dirty dozen” organic produce and buying at lower, bulk prices: organic grains, flour, sugar, dried herbs, and non-food items, such as detergent. Buying in bulk not only saves money, but produces less garbage. Over the years, cooking has become less mysterious and more of a joy. Cooking from scratch is always cheaper. See my Frugal Foodie Recipes :)! Today, with composting, single-stream recycling (as of last summer – #1 – 7 plastics and paperboard boxes, such as toilet paper rolls and cereal boxes, can now be recycled), cooking from scratch, and just buying less, we go to the town dump once every four to five weeks! Living in Fairfield, CT, in Fairfield County, one of the most expensive and affluent counties in the United States, is to be surrounded by a majority who believe that success is defined by having the most square footage, the most luxurious cars, and the latest “stuff”. I challenge you, dear reader, especially Fairfielders, to help turn this definition around: Let’s teach our children that success is defined by the ability to put people before things, and to refuse, reduce, reuse, and recycle. Less IS more. Health IS wealth. Consider joining us on our journey toward simple prosperity. The Zero Waste Home video news story I stumbled upon. Learn to Cook for Good. Previous postIs The Inside of Your Refrigerator Frugal Like Amy Dacyczyn’s (of The Tightwad Gazette)? Thank you for sharing this very powerful quote! “Let’s teach our children that success is defined by the ability to put people before things, and to refuse, reduce, reuse, and recycle. Less IS more. Health IS wealth.” It gives one a lot to think about!